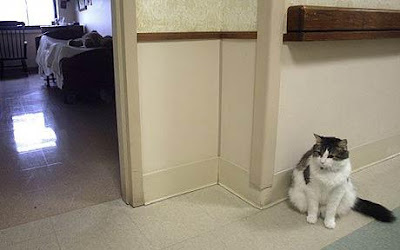 Weird, but what a nice mission in life that cat has - to comfort the dying in their last hours. Has anyone thought that maybe it's CAUSING the deaths by sucking out their souls? Just saying. Well this sin't too hard for me to believe. They do have better senses than we do. Maybe this cat can tell something is wrong by being bale to perceive something differently than we can.